James Parkinson's solo exhibition of new paintings forms the first installment in the gallery's Regional Interference exhibition cycle, profiling the most exciting emerging artists working in the South West of England. Parkinson employs painting as an open ended, contemplative language capable of reflecting a shifting ground. His work explores relationships that exist between unpredictable fragments of visual structures and forms to create objects that trouble the space between painting as image and painting as almost sculptural object. 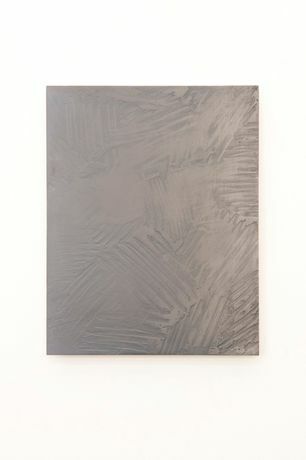 In a world of surface, often presented or flattened to the format of a screen, Parkinson is interested in where the surface begins and ends and exploits ideas of damage and repair, the accidental versus the deliberate, to wrestle painting into a complicated dialogue with the found (and even neglected) object. Although his practice has the starting point of painting, his recent concerns explore how the relationship between several paintings can breach the physical nature of their supports. In the exhibition, the paintings will be installed and the gallery walls treated in such a way as to try to suggest that the two elements have become firmly entwined, painting as part of architecture and architecture folded into painting itself. The opening coincides with Spike Island's opening of Becky Beasley, Spring Rain, and Uriel Orlow, Back to Back. Facing That is the first exhibition in the Regional Interference series, showcasing the work of 5 exciting artists currently practicing in the South West of England. For more information on Regional Interference and other events, please visit our website.